Most often than not people find themselves swinging between choosing a tour company or travelling independent when going to Sri Lanka. Whether you travel in a group or individually, this one decision can determine the whole trip. Sri Lanka is a paradise with full of wonders and with a large group of people you can surely let your imagination take the lead. If you and your friends are planning to spend your next vacation in Sri Lanka, it is recommended to apply for visa through ETA application online form for Sri Lanka. Although roaming across the country independently can be fun, one must definitely go for a guided tour. You can hire a local tour operator and customized the available packages. All you need is a mini-bus, a skilled driver and a knowledgeable guide to make sure that you get the entire information about sites you likely to visit. The teardrop shaped island offers a circular tour. From Cultural triangle to beaches and other temples can be easily covered. Start from Colombo towards the ancient city and the first capital city of Anuradhapura where you can spot many forts dating back to 5th century. Visit Polonnaruwa and Sigiriya that will definitely surprise you with their gigantic structure. 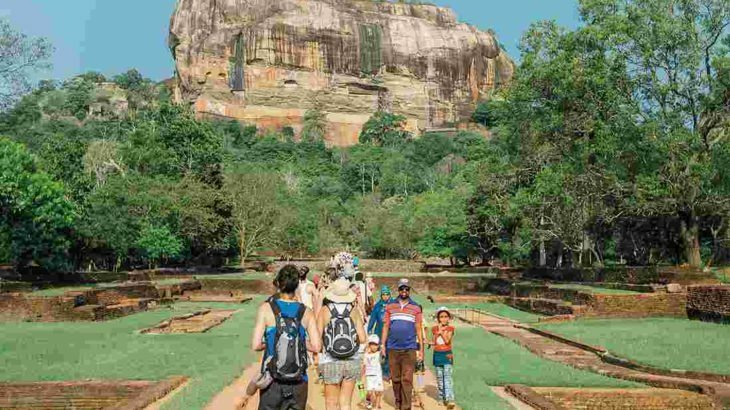 Sigiriya is famous for its rock fort which is erected on a gigantic rock. It is a fortress carved from a granite spire encompassed by steaming forests. Go to southern part to explore the beautiful Kandy and the tea country. Here you can witness the opulent temple of the tooth. The temple has a tooth relic enshrined in a golden casket. The temple holds a great religious value amongst the travelers and locals. The temple holds annual festival which is known as Kandy Esala Perahera to pay the homage to the Sacred Tooth Relic. If you happen to be in the town during the festival, stay for some more time to witness the vibrant procession. Return to Colombo via the beaches of the west coast. In Colombo, discover the ancient Gall Fort which has many cafes and hotels. If your group is a huge fan of cricket, don`t miss to watch a match in the Galle Stadium. Take a stroll across the dilapidated streets still live with the memories from the past. Apart from the pre-decided itinerary and places, you can do some research on the personal level to visit other places. The country is full of rich landscapes, idyllic beaches and rugged hills offering spectacular views. Discovering a new place with a bunch of good friends can surely make the whole experience more pleasurable. So pack your bags and download ETA application online form for Sri Lanka from our website www.sri-lankaeta.com . Business Visa, tour-travel, tourist visa, Transit Visa, visa Business Visa for Sri Lanka, How to Apply For Sri Lankan Visa, How to get Sri Lanka tourist visa. permalink.